the gas-spring clamp (GSC)—an all-steel single-tap clamp compatible with all brands of gas springs that allows in-press removal of gas springs. Tightening the fastener constricts the clamp, tightening its hold anywhere along the z axis of the spring body. 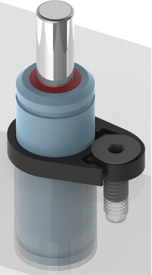 Compared to other spring-removal options—flange mount, rear fastening or sheetmetal catch—the GSC eliminates the need for a machined pocket or shims, or any custom fabrication. The GSC comes in eight models for springs 19- to 75-mm dia.